The second book is definitely more real estate focused in-depth, but uses Microsoft Excel to explain the figures and calculations. 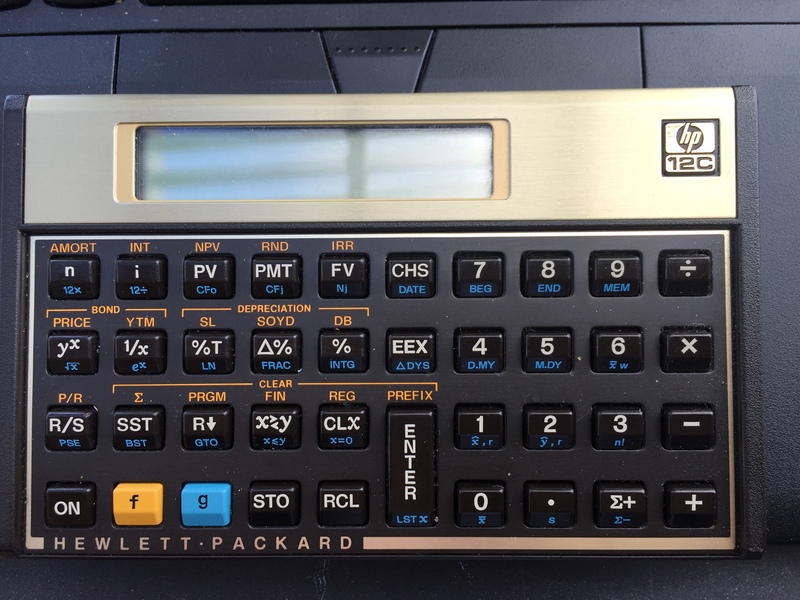 While I really enjoy using the HP-12C, I have to admit that much of my record keeping, if not analysis takes place in this environment, so using the worksheets themselves to derive my results does have it’s benefits. Both of these books were recommendations from other real estate investors on podcasts I frequent, and both are chock full of information I’ll be able to use for the rest of my life. While I’ve heard that something like 70% of college graduates never read another non-fiction book after graduation, if you’re like me and see the value of a lifetime of learning, understanding how money and investment works can make the rest of your life more enjoyable! So even though some may see it as very dry material, understand it’s the fuel that will provide your life what it needs to get up those hilltops to where everything looks more beautiful. The second book is titled “What Every Real Estate Investor Needs To Know About Cash Flow.. and 36 Other Key Financial Measures” by Frank Gallinelli. Links to both of these books will take you to Amazon where you can buy either as a paperback or Kindle version, if they interest you. A quick word about various ways to read; Especially if you’re learning something new, Kindle does include a dictionary to quickly look up any word you’re unfamiliar with, and provides an unlimited highlighter, notes section, and endless bookmarks with quick search functionality. I used to really love the ability to hold knowledge in my hands, flipping through it on real paper. When I discovered the benefits listed above, and realized I could take a hundred books with me on vacation while packing for the size of a small magazine, I was sold! Another great thing about reading off a Kindle, is the ability to upload any PDF document, either converting it to kindle format or leaving it as a PDF. Some of the symbols used in financial calculations for the user guide to my HP-12C that I also keep for reference didn’t survive the translation, so I’ve kept that in PDF format to keep it readable. Another document I’ve uploaded, but actually converted to Kindle format is one of the best books I’ve ever read. It’s less on the numbers and calculations, and more about the mindset of winding up in a situation where you CAN invest, and how to do so. In fact, it’s told as a fable, with more scenery, plot development, and enough interesting content it can be read to a child at bedtime while instilling a perhaps unconscious understanding about the way money works. This book was written almost 100 years ago, & long past copyright; it’s available for free all over the internet just Google search the title, free download. You don’t hear about it in school, though again you wonder why after reading it. This is another one I’d recommend as required reading. “The Richest Man In Babylon” by George S. Clason, is one of the easiest reads that also imparts one of the biggest impacts. If you don’t want to dive into intense financial calculations and verbiage at this point, but want an enjoyable way to educate yourself, this would be my recommendation. I hope you find some of what we’ve shared useful and happy reading! This entry was posted in Investment, Personal Finance, Real Estate. Bookmark the permalink.